At the end of the Great Tribulation, Jesus Christ will return from heaven to earth in great glory and establish His Millennial Kingdom. At the beginning of the Golden Age, the Antichrist will arrive from outer space in a UFO and proceed to establish his Saturnian Kingdom. Old Testament: The prophet Elijah ascended to heaven in a chariot of fire. Great Tribulation (end): Jesus Christ will return from heaven in like manner as He ascended and in great glory. The Millennium (beg): When Jesus Christ returns to earth, God's angels will gather His elect from the uttermost parts of heaven. Pre-Flood Era: The Aryan god kings of Atlantis were believed to have come from the constellation Orion. Old Testament Period: The Egyptians and Vedic cultures exalted the Atlantean Aryan gods in their pyramids. Church Age: The occult societies created space craft at secret UFO bases. Tribulation Period: The occult will seek refuge in outer space to escape Tribulation judgments and may relocate into space those whom they view as inferior for research purposes. Great Tribulation (beg): The Merovingian Grail Bearer (Antichrist) will arrive on earth in a space ship/UFO. The prophet Elijah ascended to heaven in a chariot of fire. At the end of the Great Tribulation, Jesus Christ will return from heaven to earth in the same manner he ascended and in great glory. When Jesus Christ returns to earth, God's angels will gather His elect from the uttermost parts of heaven. The occult believes that ancient gods and goddesses came to Earth in spacecraft. The occult believes the Annunaki/Nephilim escaped the Deluge in space ships. "100,000 [years ago]...The Anunnaki (the biblical Nefilim), to Enlil's growing annoyance marry the daughters of Man. "49,000 [years ago] Enki and Ninhursag elevate humans of Anunnaki parentage to rule in Shuruppak. Enlil, enraged. plots Mankind's demise. "13,000 [years ago] Realizing that the passage of Nibiru in Earth's proximity will trigger an immense tidal wave, Enlil makes the Anunnaki swear to keep the impending calamity a secret from Mankind. The Atlantean race of Aryans were thought to have relocated to the constellation of Orion. The Egyptians and Vedic cultures built the pyramids in the shape of Orion's belt -- the imagined home of the gods. One of the Giza pyramids recalls the Aryan race of Atlantis. The demons and the occult Prieuré de Sion are masterminding the aerospace program. The occult believes there are more highly evolved life forms, i.e. gods, on other planets. The occult will use space stations as a refuge from the Tribulation judgments. Some may try to relocate to other planets to escape the Tribulation judgments. "What was placed in the Ark of Moses, according to some scholars, were actually meteorites. Could the tale of Moses and his Ark, then, be another version of Noah and his Ark? Was the 'Exodus' of the Israelites led by Moses, then, actually a parabolic story about an interplanetary migration of man in the forgotten past? "The 911 event being a symbolic reenactment of the Flood (i.e. destruction of 'Atlantis'), wouldn't the pattern dictate that the next event be a mass 'Exodus'? Could it be just a coincidence that I conceptually equated President Bush with Moses in The Two Suns of Election MM last year? "But where would be the destination of this 'Exodus'? Where is our 'Promised Land'? The occult may relocate those whom they view as being inferior to other planets where they are exploited as research subjects and slaves. The arrival of the Antichrist, the Merovingian Grail Bearer, will be staged via UFO. 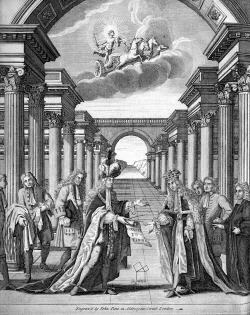 "The scene depicts one Grand Master (the Duke of Montagu) passing the scroll of the Constitutions to the next (Philip, Duke of Wharton). Both Grand Masters are supported by their officers. "In the background is a depiction of the parting of the Red Sea. Recalling the successful flight of the Israelites from the Egyptians to the promised land. This might signify here the survival of a tradition that had been in danger, but was now entering a time of security. The pillars depict the five orders of architecture introduced to England by Inigo Jones and may also allude to the five monarchs who supports the rebuilding of St Paul's Cathedral by Sir Christopher Wren between 1675 and 1708. "In the foreground is the Greek word Eureka (Archimedes' famous exclamation "I have found it!") below a representation of the 47th proposition of Euclid, a symbol which is traditionally associated with Past Masters. The UFO carrying the Grail Bearer is astrologically and mythologically represented by the Chariot of King Arthur, whose return is anticipated in the person of the next Grail King. "Sacred to the Celts, Arcturus' principal meaning is 'bear keeper' and indeed that is what he does, watching over those two constellations particularly special to King Arthur the Great and Little Bear. For the Great Bear is also known as Arthur, and to the Celts as Arthur's Wain with Boötes the constellation being cast as Arthur. Arcturus the Bearkeeper is known as 'The One who Comes' and in Ancient Egypt he was Smat - 'The One Who Rules' and Bau - 'The Coming One'. Both are reminiscent of our 'Once and Future King'. The three constellations of the Great and Little Bear and Boötes together with the star Arcturus seem to have become inextricably interwoven in myth and legend but what does remain constant is the theme of a King or Ruler who will one day come to us, and of a hunter turned herdsman who guards or keeps the King. Is this the story of the sleeping Arthur beneath the Land, written into the skies? Boötes the Herdsman brings also to mind the Great Herdsman of Celtic Myth, Cernunnos, Lord of the Animals who dwells within the groves and forests. He is Protector of all living creatures, including the one-time ruler of the great forests of the North, the bear. Arthur the Bear, protected by the Great Herdsman with his dogs at his heels - the small constellation of Canis Venatici - and the Bearkeeper speak clearly to us from the stars. The Merovingian Grail King will not be typified by King Arthur, but by Modred, his son by an incestuous relationship. As the pre-flood Nephilim sired the Merovingian race, extraterrestrials will again bring the Sangraal (sacred blood) to earth by mating with humans.